Are slots players all a bunch of little old ladies that only bet a penny at a time? How loyal are they to a favourite machine? Do players like slots just because they're easy to play? Or are big jackpots what make online slots so popular? Slotland.com’s survey of online and mobile slot machine players has now concluded and the results confirm some assumptions and dispute some stereotypes. The survey conducted through the summer and fall shows that not all slots players are old and they’re not all women. Most online and mobile slots players aren’t particularly high rollers, preferring to deposit small amounts and play it as long as they can. They want – and get -- many hours of entertainment for their gambling dollars. However, they play the game more strategically than many might think and aren’t afraid to place maximum bets when the time is right. Two-thirds like slots because they're easy to play but the other third is primarily drawn to the possibility of winning big jackpots on small wagers. Most play only on their computer but 20% said they had at least tried the mobile games. Although most don't play on their phone or PDA much or ever, most acknowledged the convenience of mobile games. Most are regulars from Slotland.com and have played there a year or more. 25% joined just to enter the contest. Nearly all play exclusively or mostly at home, not at work. Although most don't wager large amounts -- 78% said they'd never bet more than $100 -- more than half said they'd had wins over $1000. Almost unanimously agree (84%) that the way to win at slots is to stick with a machine that feels lucky. A third play video poker as well as slots. Half have at least tried online poker but only a few play online poker often. All place max bets when the time is right while a third always bet the maximum. Only a third knew that Slotland's African school project is in Malawi. Only a third have visited Vegas. Many only play online but most (60%) also play slots in casinos at least once in awhile. Slots are not a ladies-only game at all -- half of respondents were men. Mostly middle-aged and older but some (16%) under 30 as well. Survey participants were given an opportunity to enter a free contest. 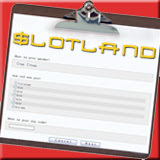 A random draw awarded player “SQUIZZER” a $500 bonus deposit to their Slotland.com account.